It’s Space School over the next two weekends, so next Monday’s (05/08/13) blog post is probably going to end up being next Wednesday’s blog post. To be honest I’m faintly amazed that this game exists at all. It’s not so much that Shadowrun Returns is the first game I’ve played that was funded start to almost-finish by Kickstarter, and it’s not so much that it’s actually turned out to be rather good. Rather, it’s that it’s been released more-or-less on time and with no cost overruns or scope changes; there have been a couple of high-profile Kickstarter delays and failures in the news recently, and so if you ask me Shadowrun Returns is just as valuable for proving that the concept can work as advertised as it is for… well, heralding the return of the Shadowrun setting to the medium of videogames in a format somewhat better suited to it than a multiplayer FPS. The Shadowrun setting itself is an off-kilter mix of cyberpunk and fantasy. It’s the near-future and while technology has progressed much as you’d expect it now co-exists rather uneasily with magic, elves and dragons, these things having made a devastating return to the world some sixty years before most Shadowrun games take place. The world is dominated by vast megacorporations locked in constant clandestine warfare, and one of the methods used to wage this war is to employ Shadowrunners – skilled mercenaries who exist outside of the conventional societal structure – as deniable assets in sabotage and espionage operations. Shadowrunners can be anything from a heavily-armoured troll with an automatic shotgun to an elf toting a cyberdeck on his back to hack into corporate computer systems; teams of Shadowrunners are hired by anonymous contacts to wreak havoc on corporate rivals by destroying or stealing valuable assets and assassinating key personnel. This is a fantastic setup for an RPG – it ought to be considering the game’s pen-and-paper origins – and the one thing Shadowrun Returns absolutely nails is this sense of place and that you, the player character, are just another mercenary working for a paycheck rather than the Chosen One out to save the world. 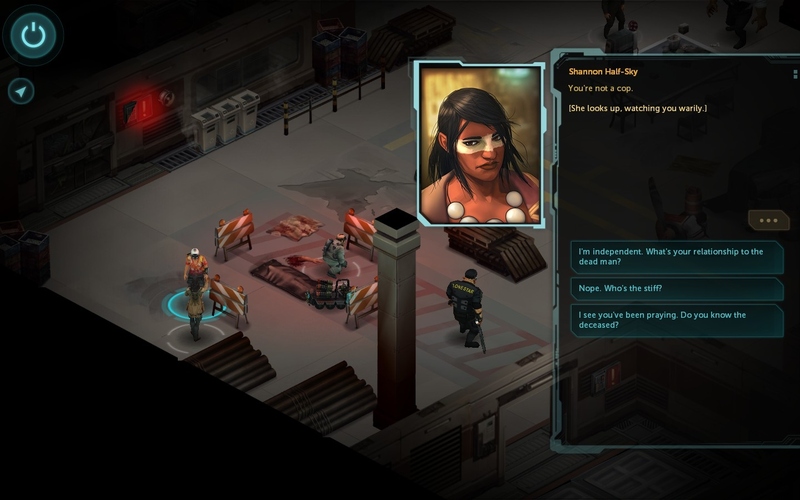 I’ve always said that if an RPG can get its world-building right it’s 90% of the way to being a good game, and Shadowrun Returns is perfect proof; the design of the game itself wobbles heavily in places and is hamstrung by bugs and technical limitations, but all these annoying little niggles are masked by a heavy, heavy balm of flavour. It’s almost wholly done through text in true Planescape Torment style, and while it’s hardly in the same league in terms of story there were definitely some talented dialogue writers working on this game. Sure, it’s a little cheesy and clichéd in places, but this is almost required in order to make you buy the larger-than-life elements of the setting and it’s quite refreshing to play something that’s unafraid to be this wordy. It displays a level of self-confidence that’s quite missing from big-budget RPGs these days. Which is a damn good thing, because in terms of structure Shadowrun Returns is as linear as they come. There is a grand total of one optional side mission in the game, with everything else being required to progress the story. Shadowrun makes full use of its copious amount of words to try to camouflage just how on-rails the game is, and it’s a testament to the writing that it largely succeeds. There may not be any side missions but there’s a lot of side conversations with no point other than to convince the player the game world is larger than it actually is. Shadowrun Returns has no voice acting whatsoever and it’s much better off without it, since it can apply all these little world-building touches and they have exactly the same weight as the stuff that’s actually relevant to the plot thanks to not being rendered in fake Chinese. The plot itself starts off in classic noir style, with a recently-deceased associate hiring you to find out who killed him, and while it does get faintly ridiculous towards the end for most of the game you’re just sleazing around the slums making contacts and following up leads to further your investigation – not to mention killing an awful lot of bad guys. Aside from the conversation the primary gameplay element of Shadowrun Returns is the combat. This has both its good and bad sides. On the good side the adaptation from the P&P rules has resulted in a streamlined XCOM-esque combat system that somehow has more depth thanks to the more detailed skill trees and range of abilities. It’s all turn based, with to-hit chances, light and heavy cover and action points that can be used to move or shoot, and the various magic spells and items provide an awful lot of options in a fight – I especially liked the stun grenades that actually stunned people instead of giving them a mild headache. On the bad side there is way too much of it; nearly all the time you spend not buried in a conversation tree is spent fighting, during which the game enters turn-based mode and never turns it off, not even when you’ve killed all the enemies that are currently attacking you. This becomes particularly annoying when it requires you to solve puzzles and explore a level in between fights, but because it can’t turn combat mode off you have to painstakingly move each member of your team around individually – and then watch them very slowly run to where you told them to go. Most of the time this is barely tolerable, and there are points in the game where it becomes outright maddening. For example, the matrix levels where one of your team hacks into virtual reality to open a door are utter garbage because they strip out all of the interesting parts of the combat while doubling the amount of running around you do. Worse is that while you’re doing this the rest of the team will be under attack back in the real world, and while this does introduce an interesting time pressure to the VR segments you’re already trying to get through them as quickly as possible because they’re so terrible. Still, the clunky combat turns wouldn’t be so much of a problem if it wasn’t for the single biggest mistake Shadowrun Returns makes, which is to a) rely on a checkpointing system to save the game and then b) only put the checkpoints at the start of levels. This is something that has “technical limitation” written all over it, and it’s clear that in order to become this paragon of Kickstarter punctuality the decision was taken to cut manual saving out of the game because it would have taken too much time to implement. From a business perspective of finishing Shadowrun Returns before they ran out of money it was a perfectly sound decision. 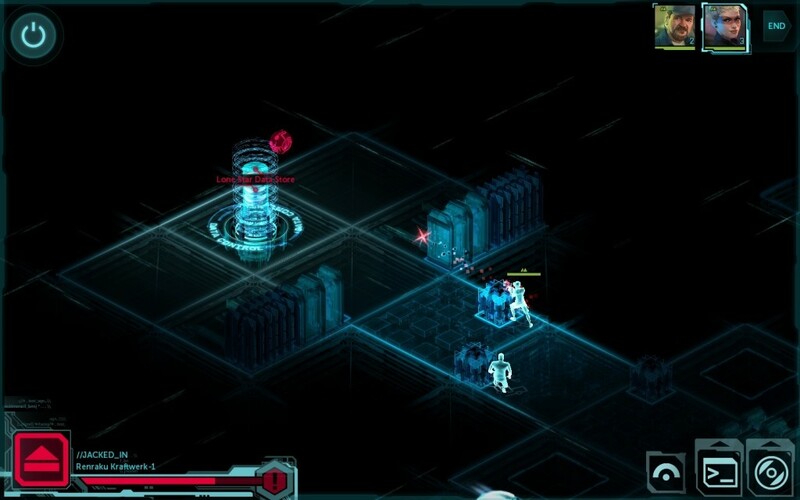 From a gameplay point of view, though, it nearly kills Shadowrun stone cold dead because not only do large portions of the levels consist of tedious running around, but they often take 25-30 minutes to finish. Quite aside from the amount of lost progress you can tot up if you die/the game crashes/whatever this means that I could not, for example, quit Shadowrun Returns in the middle of a level to go off and play Dota, I couldn’t even alt-tab out of the game because – as I discovered to my cost – it doesn’t like alt-tabbing at all. Once you start a level you’re committed to finishing it that session, and they’re just too long for me to be able to forgive that easily; there were several occasions when I couldn’t face booting up the again because I didn’t have the time or the willpower required to complete a level in one sitting. That’s not a reaction that I should ever have to a game made in the 21st century. As annoying as the save system is, though, it wasn’t enough to stop me from finishing the game and enjoying myself for the vast majority of its length. It’s that sense of place that kept hooking me back in – that and my in-built love of cyberpunk. 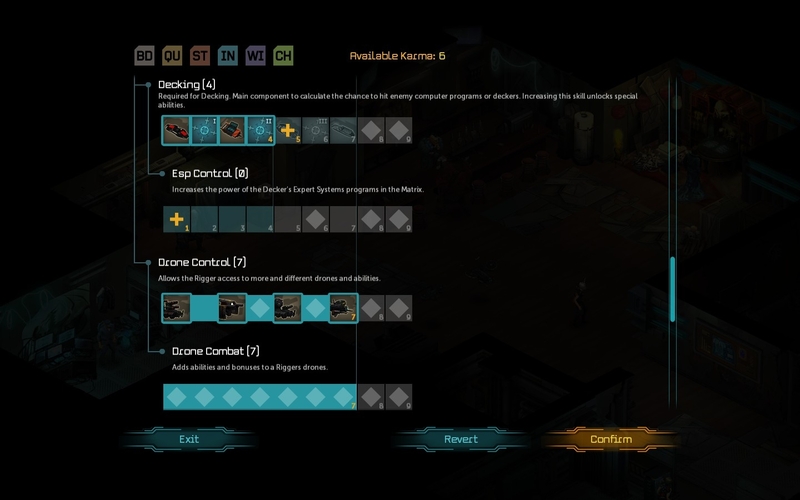 Despite the save system, despite the turn-based exploring, despite all the little bugs that I really do hope get ironed out at some point because they make certain character archetypes useless, Shadowrun Returns scratches an itch that I had almost forgotten existed. It’s a game that knows how to paint a world in broad strokes (and awesome character portraits) and then let the player’s imagination fill in the detail; it’s a game that recognises that sometimes I don’t want to save the world from an ancient evil from beyond time and space. 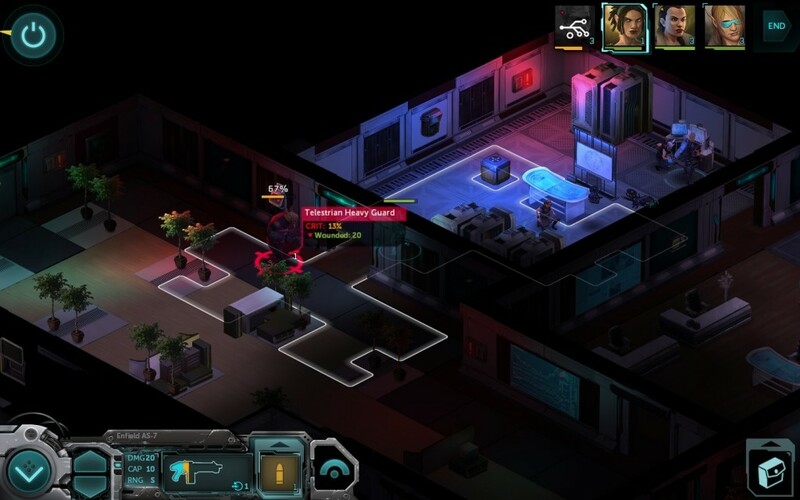 Above all it’s a game that understands the morally grey world of Shadowrun, where in one mission you might take down a high-tech drug gang and then in the next gun down entire squads of cop-equivalents because they were between you and the thing you’d been hired to collect. It’s a budget game with budget production values that nevertheless punches well above its weight in the RPG stakes; partly this is because most modern RPGs are designed by focus group and end up being rather bland as a result, but it’s also because there’s genuinely a lot to like about Shadowrun Returns and its decidedly old-school approach to the genre. It’s enough of a success to validate the Kickstarter business model all by itself, and if even half of my other Kickstarted titles end up being this good I’d say I’m in for a very interesting year of gaming indeed. Been on the fence with this, and you seem to be echoing the mixed sentiments that RPS had. Super tempted, but with my backlog as it is, I think I’ll wait for a price reduction and/or confirmation that some of the quirks have been ironed out. Out of interest, have you tried Expeditions: Conquistador? Another Kickstarter-funded turn-based RPG with lots of text. I rather enjoyed it, even if it got kind of repetetive. Interestingly enough this has been the first game that I’ve personally reviewed, that everything I’ve said about it agrees with what everyone else has said (including Hentzau here). It seems to be remarkable in getting so many things completely right, whilst getting so many others completely wrong. My recommendation is to wait for some good mods to come out (assuming they do), unless you’re in need of a cyberpunk hit. I have no doubt the mod community can produce something that’s as technically (un)accomplished as Shadowrun Returns, but any user-created content will live and die on the strength of its writing, just as Shadowrun Returns does — and that’s the one thing mods tend not to be that great at. Still, I at least hear there’s some conversions of old P&P Shadowrun campaigns in the works, so that should be interesting. Bought it, played it, ragequit it after my first battle was against native warriors who could move and shoot twice. I’ll go back to it after the Space School madness has died down a bit. Battle system is not just XCOMesque, it’s almost copypasted from there. And save system is killing everybody. For several days I don’t return to game’s final boss cause I know I’ll have to go through dialog and 10 minutes of easy part of battle during which everybody will sloooowly raise their hands to cast something and walk from place to place. Also, decker class is curiously useless, as each time you need to go to Matrix the game gives you a good decker and – most of the time – only 1 jack. And decker battle skill – the one that raises chance to hit specific enemy – is also useless because you can’t hit anybody with it. For that matter, professional soldiers can’t hit a thing from 2 meters with bloody shotgun. Good game with massive frustration features. I think that deckers are another thing that fell foul of Shadowrun Returns releasing on time and on budget, since there’s maybe one optional decker segment in the whole game. Everything else was part of the main plotline, and they *have* to give you a good decker if they’re doing that because you might not have one otherwise. And I don’t know what P&P Shadowrun combat is like, but I was surprised at how heavily they borrowed basic UI stuff like cover markers from XCOM. They could have done a lot worse, mind. I think it can do, yeah. A weird failure of what should be fairly basic progression through the game. To be fair, in class-based games there always seems to be at least one that doesn’t work well for some reason or other. And I absolutely LOVE when someone figures out how to make a seemingly crappy class work well. For instance, I could honestly discuss the balance of Final Fantasy Tactics’ classes all day long.